London (Wednesday 2 May 2018) — Launch22 today announced it has been recognized as winner of the 2018 Coworker Members’ Choice Award for London. 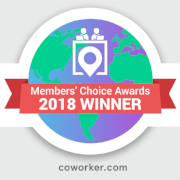 Members’ Choice award winners were determined based on the thousands of reviews, votes and opinions collected in a single year from coworking space members worldwide. Launch22 have recently moved into a new location, 32 Cubitt Street, Our space is open-planned, with lots of plants and greenery that inject vitality and energy into the space; it is buzzing environment for creativity, innovation, with a community of people who really want to see each other succeed. Pairing that with networking events, fireside chats and Pizza Fridays, we aim to motivate our members, and make their work life enjoyable. Older PostLaunch22 and Tech City's Digital Business Academy are now partners!